Turning 50, for some people, is difficult. For some reason the number 50 is hard for them to deal with. When a family member or friend is turning 50 and seems sad or upset about it, throwing them a party can help. A surprise 50th birthday party can be fun for everyone. It can help the birthday person realize that 50 is just a number. When planning the surprise party think of fun birthday party gifts, favors, and game ideas that are sure to make it special and fun for everyone. 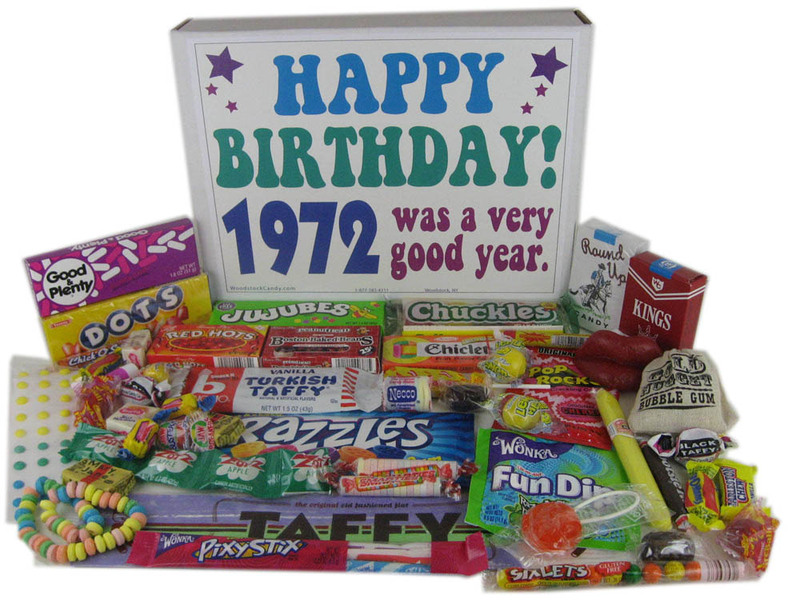 A person can find retro candy to use as 50th birthday party favors and gifts. This type of candy will be sure to put a smile on everyone's face as it brings back happy memories of childhood. These wonderful memories will take them back to the carefree days spent riding bikes and having fun with friends. They will think back to the days when a kid could go into the little corner store with a quarter and come out with a bag of candy. This retro 50th birthday party candy will remind them of the days of penny candy and the joy they had buying and eating it. All of the fun and happy memories may just help the birthday person feel better about turning 50 by making them smile, laugh and relive those happy memories. Keeping the 50th birthday party theme nostalgic, a person can add fun games from childhood to the mix. There are some great games that will get everyone moving, laughing, and having a good time including Simon Says and Red Rover. Those favorite games of childhood will be sure to liven up the party. Hot Potato and musical chairs are games that can also be played. Any game that will bring happy laughter and excited cheers would be a good idea for this type of party. A person can find some comical 50th birthday party favors including glasses in the shape of the number 50 that each guest can wear. There are blue ribbons for the birthday person which will let them know they are great at 50. Paddle balls, wooden gliders, and kazoos are fun party favor ideas also. Bubbles are fun at any age and can be wonderful birthday party gifts and favors. Planning a party to help a loved one celebrate a milestone in a special way by adding 50th birthday party candy including Dots, Chiclets, Fun Dip and those wonderful Buttons on Paper is a great idea. Everyone who is at the party is sure to have a great time, enjoy the retro candy, and laugh at the games. The birthday person will relive many happy memories and have a truly unique experience at their 50th birthday party. Whether you are looking for a taste of candy from your childhood or if you are looking to give a gift of old fashioned candy to a friend or a loved one, you have plenty of options to choose from regardless of your purpose for shopping for the classic candy. You can find all types of candy from a variety of past decades for sale depending on the type of sweet treat you are seeking. There are wax lip candy, red hot candies, sugar sticks, candy necklaces, and even the classic "Pop Rocks" candies. Candy from the 1950’s range from: dotted sugar candies, candy cigarettes, taffy, bubble gum cigars, mints, lemon candies, root beer barrels, and even atomic fireballs. Wax lips, "Mary Janes", and candy buttons were all common candies available in the 1950s and still sold today. If you are searching for candies from the 1960s, popular candies included the well-known Tootsie Roll, candy cigarettes, "Fun Dip", candy lipstick, wax lips, Mary Janes, "Now & later", candy buttons, Razzles, smarties, and taffy. Retro candies from the 1970s include "Zotz", Red Hots, Lemonheads, Fun Dip, Atomic Fireballs, Pop Rocks, candy necklaces and cigarettes, "Pixy Stix", "Now & Later" and "Gold Nugget Bubble Gum". 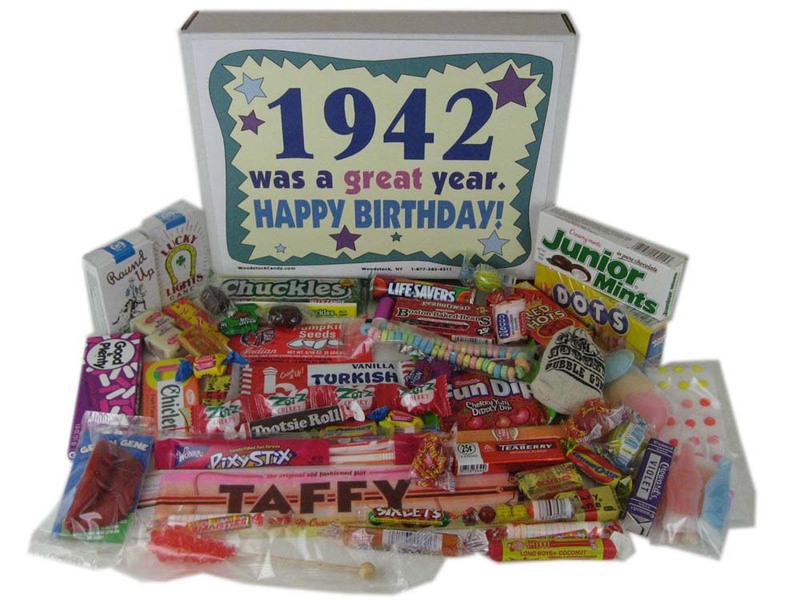 Candies that became popular in the 1980s includes Jolly Rancher sticks, "Big League" chewing gum, "Sour Patch Kids", "Twizzlers", candy buttons on paper, gummy bears, Necco Wafers, Skittles, Airheads, Starburst, Swedish Fish, Juicy Fruit Gum, and Atomic Fireballs. If you are seeking a gift to give to someone, you can also opt for a retro nostalgic candy gift basket. There are various gift baskets of retro candy by the decade and including a mix, depending on the type of candy you want to order. You can shop for old fashioned candy locally and also right from the comfort of your own home, regardless of the types of candy you are shopping for or if you are looking for a retro nostalgic candy gift basket to buy. When you look online, you will have more advantages when shopping for candy as opposed to looking for the retro candy you are interested in locally at multiple stores. When you are seeking some nostalgic candy and want to do so online, you have more options when finding the specific brand and type of candy you have in mind. When you browse online to order the candy you want, you will also have the opportunity to compare prices to find the best deals and to find a retronostalgic candy gift basket to give if you are shopping for someone else. Before you place your order, you can also read on all of the included candies offered in mixes and in baskets available to try. When you shop online for retro candy, you also have the option to easily shop by decade, which is great for themed parties or for specific candy lovers. When shopping for a great gift to make someone's 80th birthday as special as possible, consider an 80th birthday candy gift. These candy baskets will contain all of the sweet treats that the 80 year old used to enjoy as a child. It will be a great way to bring back sweet memories for the birthday boy or girl. You'll find that the 80th birthday candy gift baskets contain items such as Bit-O-Honey, candy buttons on paper, Boston Baked Beans, Gold Mine Gum, Junior Mints, Giant Taffy and so much more to make their birthday one that is as sweet as it is unforgettable. They'll love all of the candies that remind them of their childhood days. 80th party gifts can be hard to choose but with the candy baskets, you'll be able to make their 80th birthday special and fun. Items like the wax lips and the wax bottles are certain to bring a smile to their face. Turning 80 is really a great reason to celebrate and give the birthday boy or girl something that is truly going to brighten their day. These candy baskets will make the best 80th party gifts to create a real celebration. You may find that others will want to have a taste of the great candies that are in the basket too. However, the gift recipient may want to keep their 80th birthday candy gift all to themselves. Just because the gift baskets contain candy from the past doesn't mean that the candy is old. These candies are all freshly made and can still be purchased in some stores today. Each type is going to be of the best quality and provide the same wonderful taste that it did back in the day. When you're planning that special 80th birthday party for your loved one, be sure and include a candy gift basket. It's a great way to insure that they receive a gift that brings back a blast from the past, which is fun and entertaining and is also delicious. You won't find a more suitable gift that will bring such happiness to them. These great candy gift baskets will eliminate having to stress over what to get the person who has everything. There so much better than a gift certificate or just a card too. 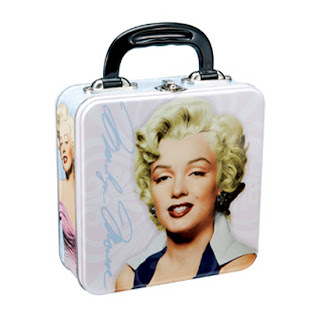 You won't find a better gift choice to honor the 80 year old in your life. A thirtieth birthday is a milestone in anyone's life. Gone are the days when reaching thirty was considered as being a dreaded age. Such an occasion calls for a celebration to create memories to last a lifetime. The presentation of a gift for the birthday celebrant can make all the difference so you want to be sure to select a gift that is nothing less than perfect. One gift that is sure to get you noticed as a connoisseur when it comes to gift-giving, is a custom 30th birthday candy basket. These candy baskets come in all sizes and contain a variety of mouth-watering gourmet treats and, sometimes, colorful balloons. Over-sized chocolate chip cookies are also a popular item in these candy baskets as well as different types of wine and a large assortment of 30th birthday candy and chocolate. Another unique idea when shopping for the right birthday basket are those with a nostalgic theme. Assortments of retro candies from days gone by are featured in these baskets. 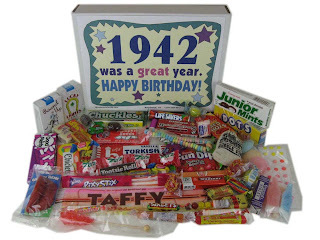 Candy items such as Dots, Jujubes and candy necklaces, to name only a few, can be found in the nostalgia birthday basket. This theme of birthday basket is sure to make a tremendous impression on the lucky recipient. It will remind them of the days when life was carefree and simple and will bring a smile to their face and, perhaps, even a tear to their eye. Equally as fun, are 30th birthday candy baskets that carry a theme of the year the recipient was born. For instance, if the birthday boy or girl was born in the year 1980, birthday baskets would generally contain treats which were popular during that year or decade. The theme of these birthday baskets may feature Fruit Roll-Ups, rice cakes and Big League Chewing gum. In selecting a birthday basket as a gift with a particular theme, there are so many fun varieties to choose from. These baskets will, no doubt, receive remarkable compliments not only from the recipient but also the party guests. Obviously, for the more conservative birthday boy or girl, the possibilities of selecting a birthday basket with no particular theme at all, are endless. While these baskets are acceptable in all birthday celebrations, the baskets designed to fit this once-in-a-lifetime occasion like the 30th birthday, will be remembered for years to come. Since life is all about the creation of memories, you can rest assured your choice in the "just right" gift was selected in a most perfect way. Although becoming more common, an 80th birthday is still a relatively rare occurrence and deserves that extra special touch, from the decorations to the cake, and the presents. However, when it comes to presents problems can arise; there is hardly anything to give an 80 year old that they do not have already. Once framed pictures of loved ones, gift cards and additional collectables have been given, what else is there that they would really enjoy. Between their reduced activity and a lifetime of acquiring what they want and need, finding 80th party gifts can be a real challenge. One unique and affordable gift, that will bring a smile to any senior's face, is a gift box of nostalgic candy. This gift works on two levels. First, as we age our desire for sweets increase and by the time one reaches 80 years or more the desire to remain thin has subsided. Secondly, someone celebrating their 80th birthday or who is in their 80s spent their early childhood in the Great Depression, and they probably has few chances to enjoy their favorite candies when young. You can give them a second chance to relish the tastes they craved as a child. In all likelihood they may think those candies are gone for good. They probably have not thought of them for years but will recognize and still enjoy them today. Opening a window to the past and allowing them to experience the sweets tastes from long ago makes a gift that stands out from the rest, and unlike fruit, candy keeps a long time. Many of the old-fashioned candies are individually wrapped pieces instead of bars, making them convenient when just a small something sweet is desired. They can take some of their birthday candy with them in a purse or pocket wherever they go. They can make an instant trip back to their childhood or share the journey with another senior who has a sweet tooth. Gift baskets are available featuring some of the old time favorites such as Violets, Rock Candy, Good & Plenty and Chuckles. An alternative idea is to make a birthday basket of your own, including these and many other childhood favorite. A homemade basket put together for an 80th birthday candy gift can include their more recent favorite sweets and other nostalgic items such as a Pages of Time Booklet. 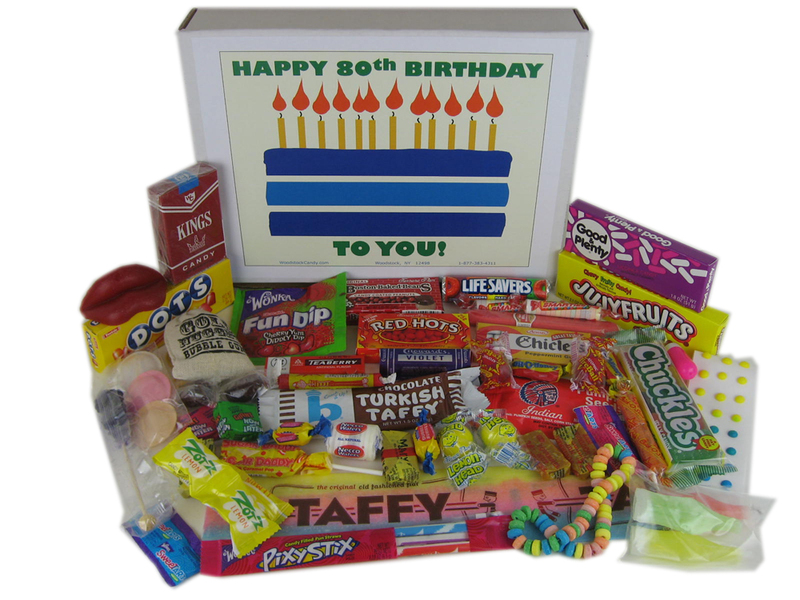 Best of all personalized 80th birthday candy gifts are not just a one shot deal they can be given every year with slight modifications to reflect the birthday boy or girls preferences. In addition, 80th party gifts of nostalgic candy are not limited to birthdays but work for Mother’s Day, Father’s Day or Christmas as well.